As your child reaches their teen years it is important for them to develop a good skin care routine. It can help to avoid pimples, blackheads and the dreaded acne and will give them a headstart for their adult years. I have put together some teen skin care tips that are good to start early. There are 4 main skin types, normal, oily/greasy, dry and combination. Before getting your teen going with their skincare routine it is important to find out which skin type they are as this will affect their cleaning routine and which products they should use. Normal skin just means that you have a good balance of oil and water which leaves your skin with very few blemishes and means it is neither dry nor greasy. Wash your face morning and night with a mild cleanser or a warm water and a mild skin soap. The most common skin type is combination skin. This is where you have a T-Bar of oily skin, across the forehead and down the nose to the chin. And the rest of your skin can be dry. Cleanse your skin morning and night with a mild, perfume and alcohol free facial soap and warm water and pat it dry. Use moisturiser on the dry areas but not the oily spots. Dry skin is caused when your body loses more moisture than usual. It can look dull and feel slightly rough to the touch. Dry skin occurs more frequently when the weather is colder, humidity is lower and you spend time in artificially heated rooms and then come out into the cold. Avoid really hot showers or baths, as this increases the dehydration of their skin. Moisturise morning and evening with a suitable, perfume and alcohol free moisturiser after gently cleansing with a mild cleanser. Greasy/Oily skin is usually shiny and the pores are much more obvious than with other skin types. Teens with oily skin are often more prone to acne and pimples and the condition of the skin can become worse during times of stress, such as exam time. Cleanse it gently morning and night using warm water and a non perfumed facial soap. Try and keep your fringe off your forehead. 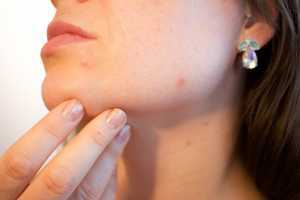 Don’t be tempted to squeeze spots as this can cause inflammation and scars to form. If your teen has a severe case of acne, bring them along to the GP or a dermatologist for advice. Only use products suitable for your skin type and your age. For instance if you don’t have facial soap or cleanser, just use warm water and a facecloth as regular soap products can irritate the sensitive facial skin. Test a small patch of your skin before using a new product.